Use only if a clear diagnosis of migraine or cluster headache has been established. If a patient has no response to the first migraine or cluster headache attack treated with IMITREX injection, reconsider the diagnosis before IMITREX injection is administered to treat any subsequent attacks. IMITREX injection is not indicated for the prevention of migraine or cluster headache attacks. The maximum single recommended adult dose of IMITREX injection for the acute treatment of migraine or cluster headache is 6 mg injected subcutaneously. For the treatment of migraine, if side effects are dose limiting, lower doses (1 mg to 5 mg) may be used [see Clinical Studies (14.1)]. For the treatment of cluster headache, the efficacy of lower doses has not been established. The maximum cumulative dose that may be given in 24 hours is 12 mg, two 6-mg injections separated by at least 1 hour. A second 6-mg dose should only be considered if some response to a first injection was observed. 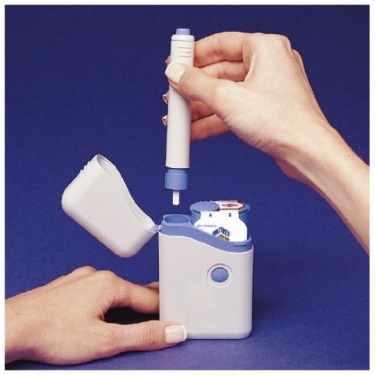 An autoinjector device (IMITREX STATdose Pen) is available for use with 4-mg and 6-mg prefilled syringe cartridges. With this device, the needle penetrates approximately 1/4 inch (5 to 6 mm). The injection is intended to be given subcutaneously, and intramuscular or intravascular delivery must be avoided. 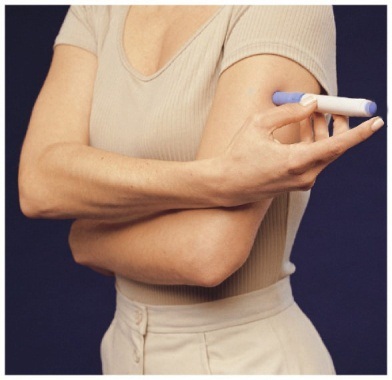 Instruct patients on the proper use of IMITREX STATdose Pen and direct them to use injection sites with an adequate skin and subcutaneous thickness to accommodate the length of the needle. The needle shield of the prefilled syringe contains dry natural rubber (a latex derivative) [see Warnings and Precautions(5.9)]. 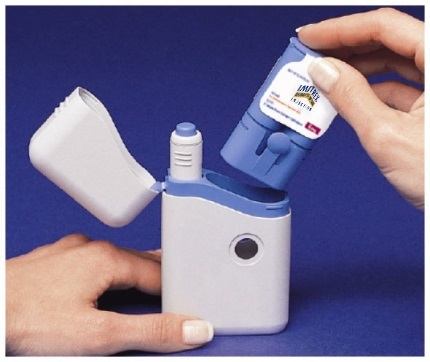 In patients receiving doses other than 4 mg or 6 mg, use the 6-mg single-dose vial; do not use the IMITREX STATdose Pen. Visually inspect the vial for particulate matter and discoloration before administration. Do not use if particulates and discolorations are noted. Injection: 4-mg and 6-mg single-dose prefilled syringe cartridges for use with the IMITREX STATdose Pen. Recent use (i.e., within 24 hours) of ergotamine-containing medication, ergot-type medication (such as dihydroergotamine or methysergide), or another 5-hydroxytryptamine 1 (5-HT 1) agonist [see Drug Interactions (7.1, 7.3)]. Hypersensitivity to IMITREX (angioedema and anaphylaxis seen) [see Warnings and Precautions (5.9)]. The use of IMITREX injection is contraindicated in patients with ischemic or vasospastic CAD. There have been rare reports of serious cardiac adverse reactions, including acute myocardial infarction, occurring within a few hours following administration of IMITREX injection. Some of these reactions occurred in patients without known CAD. IMITREX injection may cause coronary artery vasospasm (Prinzmetal’s angina), even in patients without a history of CAD. Perform a cardiovascular evaluation in triptan-naive patients who have multiple cardiovascular risk factors (e.g., increased age, diabetes, hypertension, smoking, obesity, strong family history of CAD) prior to receiving IMITREX injection. If there is evidence of CAD or coronary artery vasospasm, IMITREX injection is contraindicated. For patients with multiple cardiovascular risk factors who have a negative cardiovascular evaluation, consider administering the first dose of IMITREX injection in a medically supervised setting and performing an electrocardiogram (ECG) immediately following administration of IMITREX injection. For such patients, consider periodic cardiovascular evaluation in intermittent long-term users of IMITREX injection. Life-threatening disturbances of cardiac rhythm, including ventricular tachycardia and ventricular fibrillation leading to death, have been reported within a few hours following the administration of 5-HT1 agonists. Discontinue IMITREX injection if these disturbances occur. 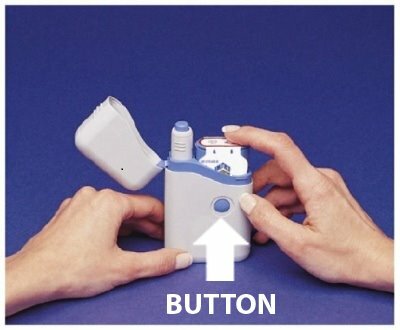 IMITREX injection is contraindicated in patients with Wolff-Parkinson-White syndrome or arrhythmias associated with other cardiac accessory conduction pathway disorders. Sensations of tightness, pain, pressure, and heaviness in the precordium, throat, neck, and jaw commonly occur after treatment with IMITREX injection and are usually non-cardiac in origin. However, perform a cardiac evaluation if these patients are at high cardiac risk. The use of IMITREX injection is contraindicated in patients with CAD and those with Prinzmetal’s variant angina. Cerebral hemorrhage, subarachnoid hemorrhage, and stroke have occurred in patients treated with 5-HT1 agonists, and some have resulted in fatalities. In a number of cases, it appears possible that the cerebrovascular events were primary, the 5-HT1 agonist having been administered in the incorrect belief that the symptoms experienced were a consequence of migraine when they were not. Also, patients with migraine may be at increased risk of certain cerebrovascular events (e.g., stroke, hemorrhage, TIA). Discontinue IMITREX injection if a cerebrovascular event occurs. Before treating headaches in patients not previously diagnosed with migraine or cluster headache or in patients who present with atypical symptoms, exclude other potentially serious neurological conditions. IMITREX injection is contraindicated in patients with a history of stroke or TIA. IMITREX injection may cause non-coronary vasospastic reactions, such as peripheral vascular ischemia, gastrointestinal vascular ischemia and infarction (presenting with abdominal pain and bloody diarrhea), splenic infarction, and Raynaud’s syndrome. In patients who experience symptoms or signs suggestive of non-coronary vasospasm reaction following the use of any 5-HT1 agonist, rule out a vasospastic reaction before receiving additional injections of IMITREX. Serotonin syndrome may occur with IMITREX injection, particularly during coadministration with selective serotonin reuptake inhibitors (SSRIs), serotonin norepinephrine reuptake inhibitors (SNRIs), tricyclic antidepressants (TCAs), and MAO inhibitors [see Drug Interactions (7.4)]. Serotonin syndrome symptoms may include mental status changes (e.g., agitation, hallucinations, coma), autonomic instability (e.g., tachycardia, labile blood pressure, hyperthermia), neuromuscular aberrations (e.g., hyperreflexia, incoordination), and/or gastrointestinal symptoms (e.g., nausea, vomiting, diarrhea). The onset of symptoms usually occurs within minutes to hours of receiving a new or a greater dose of a serotonergic medication. Discontinue IMITREX injection if serotonin syndrome is suspected. Significant elevation in blood pressure, including hypertensive crisis with acute impairment of organ systems, has been reported on rare occasions in patients treated with 5-HT1 agonists, including patients without a history of hypertension. Monitor blood pressure in patients treated with IMITREX. 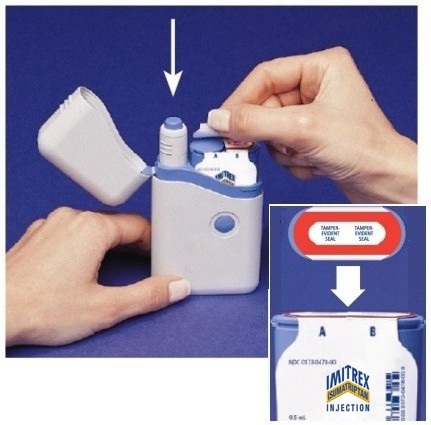 IMITREX injection is contraindicated in patients with uncontrolled hypertension. Hypersensitivity reactions, including angioedema and anaphylaxis, have occurred in patients receiving IMITREX. Such reactions can be life-threatening or fatal. In general, anaphylactic reactions to drugs are more likely to occur in individuals with a history of sensitivity to multiple allergens. IMITREX injection is contraindicated in patients with a history of hypersensitivity reaction to IMITREX. The needle shield of the prefilled syringe contains dry natural rubber (a latex derivative) that has the potential to cause allergic reactions in latex-sensitive individuals. Seizures have been reported following administration of IMITREX. Some have occurred in patients with either a history of seizures or concurrent conditions predisposing to seizures. There are also reports in patients where no such predisposing factors are apparent. IMITREX injection should be used with caution in patients with a history of epilepsy or conditions associated with a lowered seizure threshold. Table 1 lists adverse reactions that occurred in 2 U.S. placebo‑controlled clinical trials in patients with migraines (Studies 2 and 3) following either a single 6‑mg dose of IMITREX injection or placebo. Only reactions that occurred at a frequency of 2% or more in groups treated with IMITREX injection 6 mg and that occurred at a frequency greater than the placebo group are included in Table 1. 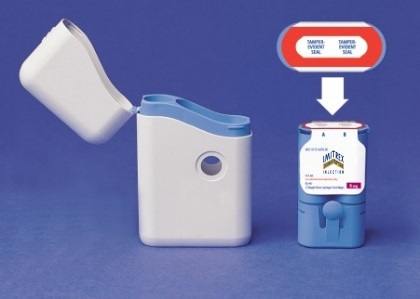 In the controlled clinical trials assessing the efficacy of IMITREX injection as a treatment for cluster headache (Studies 4 and 5), no new significant adverse reactions were detected that had not already been identified in trials of IMITREX in patients with migraine. Overall, the frequency of adverse reactions reported in the trials of cluster headache was generally lower than in the migraine trials. Exceptions include reports of paresthesia (5% IMITREX injection, 0% placebo), nausea and vomiting (4% IMITREX injection, 0% placebo), and bronchospasm (1% IMITREX injection, 0% placebo). The following adverse reactions have been identified during postapproval use of IMITREX tablets, IMITREX nasal spray, and IMITREX injection. Because these reactions are reported voluntarily from a population of uncertain size, it is not always possible to reliably estimate their frequency or establish a causal relationship to drug exposure. Ergot-containing drugs have been reported to cause prolonged vasospastic reactions. Because these effects may be additive, use of ergotamine-containing or ergot-type medications (like dihydroergotamine or methysergide) and IMITREX injection within 24 hours of each other is contraindicated. MAO-A inhibitors increase systemic exposure by 2-fold. Therefore, the use of IMITREX injection in patients receiving MAO-A inhibitors is contraindicated [see Clinical Pharmacology (12.3)]. Because their vasospastic effects may be additive, coadministration of IMITREX injection and other 5-HT1 agonists (e.g., triptans) within 24 hours of each other is contraindicated. The developmental and health benefits of breastfeeding should be considered along with the mother’s clinical need for IMITREX injection and any potential adverse effects on the breastfed infant from sumatriptan or from the underlying maternal condition. Infant exposure to sumatriptan can be minimized by avoiding breastfeeding for 12 hours after treatment with IMITREX injection. Safety and effectiveness in pediatric patients have not been established. IMITREX injection is not recommended for use in patients younger than 18 years of age. Two controlled clinical trials evaluated IMITREX nasal spray (5 to 20 mg) in 1,248 pediatric migraineurs aged 12 to 17 years who treated a single attack. The trials did not establish the efficacy of IMITREX nasal spray compared with placebo in the treatment of migraine in pediatric patients. Adverse reactions observed in these clinical trials were similar in nature to those reported in clinical trials in adults. Five controlled clinical trials (2 single-attack trials, 3 multiple-attack trials) evaluating oral IMITREX (25 to 100 mg) in pediatric patients aged 12 to 17 years enrolled a total of 701 pediatric migraineurs. These trials did not establish the efficacy of oral IMITREX compared with placebo in the treatment of migraine in pediatric patients. Adverse reactions observed in these clinical trials were similar in nature to those reported in clinical trials in adults. The frequency of all adverse reactions in these patients appeared to be both dose- and age‑dependent, with younger patients reporting reactions more commonly than older pediatric patients. Postmarketing experience documents that serious adverse reactions have occurred in the pediatric population after use of subcutaneous, oral, and/or intranasal IMITREX. These reports include reactions similar in nature to those reported rarely in adults, including stroke, visual loss, and death. A myocardial infarction has been reported in a 14-year-old male following the use of oral IMITREX; clinical signs occurred within 1 day of drug administration. Clinical data to determine the frequency of serious adverse reactions in pediatric patients who might receive subcutaneous, oral, or intranasal IMITREX are not presently available. Clinical trials of IMITREX injection did not include sufficient numbers of patients aged 65 years and older to determine whether they respond differently from younger patients. Other reported clinical experience has not identified differences in responses between the elderly and younger patients. In general, dose selection for an elderly patient should be cautious, usually starting at the low end of the dosing range, reflecting the greater frequency of decreased hepatic, renal, or cardiac function and of concomitant disease or other drug therapy. A cardiovascular evaluation is recommended for geriatric patients who have other cardiovascular risk factors (e.g., diabetes, hypertension, smoking, obesity, strong family history of CAD) prior to receiving IMITREX injection [see Warnings and Precautions (5.1)]. Coronary vasospasm was observed after intravenous administration of IMITREX injection [see Contraindications (4)]. Overdoses would be expected from animal data (dogs at 0.1 g/kg, rats at 2 g/kg) to possibly cause convulsions, tremor, inactivity, erythema of the extremities, reduced respiratory rate, cyanosis, ataxia, mydriasis, injection site reactions (desquamation, hair loss, and scab formation), and paralysis. The elimination half-life of sumatriptan is about 2 hours [see Clinical Pharmacology (12.3)]; therefore, monitoring of patients after overdose with IMITREX injection should continue for at least 10 hours or while symptoms or signs persist. The empirical formula is C14H21N3O2S•C4H6O4, representing a molecular weight of 413.5. Sumatriptan succinate is a white to off-white powder that is readily soluble in water and in saline. IMITREX injection is a clear, colorless to pale yellow, sterile, nonpyrogenic solution for subcutaneous injection. 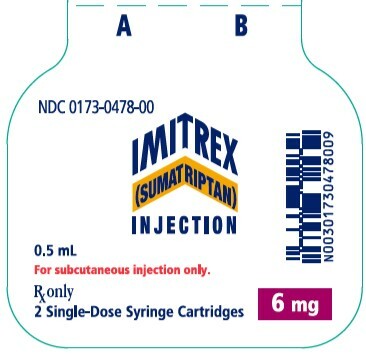 Each 0.5 mL of IMITREX injection 8-mg/mL solution contains 4 mg of sumatriptan (base) as the succinate salt and 3.8 mg of sodium chloride, USP in Water for Injection, USP. Each 0.5 mL of IMITREX injection 12-mg/mL solution contains 6 mg of sumatriptan (base) as the succinate salt and 3.5 mg of sodium chloride, USP in Water for Injection, USP. The pH range of both solutions is approximately 4.2 to 5.3. The osmolality of both injections is 291 mOsmol. Following a 6-mg subcutaneous injection into the deltoid area of the arm in 9 males (mean age: 33 years, mean weight: 77 kg) the volume of distribution central compartment of sumatriptan was 50 ± 8 liters and the distribution half‑life was 15 ± 2 minutes. Patients with Hepatic Impairment: The effect of mild to moderate hepatic disease on the pharmacokinetics of subcutaneously administered sumatriptan has been evaluated. There were no significant differences in the pharmacokinetics of subcutaneously administered sumatriptan in moderately hepatically impaired subjects compared with healthy controls. The pharmacokinetics of subcutaneously administered sumatriptan in patients with severe hepatic impairment has not been studied. The use of IMITREX injection in this population is contraindicated [see Contraindications (4)]. Racial Groups: The systemic clearance and Cmax of subcutaneous sumatriptan were similar in black (n = 34) and Caucasian (n = 38) healthy male subjects. Monoamine Oxidase-A Inhibitors: In a trial of 14 healthy females, pretreatment with an MAO-A inhibitor decreased the clearance of subcutaneous sumatriptan, resulting in a 2-fold increase in the area under the sumatriptan plasma concentration-time curve (AUC), corresponding to a 40% increase in elimination half-life. Dogs receiving oral sumatriptan developed corneal opacities and defects in the corneal epithelium. Corneal opacities were seen at the lowest dose tested, 2 mg/kg/day, and were present after 1 month of treatment. Defects in the corneal epithelium were noted in a 60-week study. Earlier examinations for these toxicities were not conducted and no-effect doses were not established; however, the relative plasma exposure at the lowest dose tested was approximately 3 times the human exposure after a 6-mg subcutaneous dose. In controlled clinical trials enrolling more than 1,000 patients during migraine attacks who were experiencing moderate or severe pain and 1 or more of the symptoms enumerated in Table 3, onset of relief began as early as 10 minutes following a 6-mg IMITREX injection. Lower doses of IMITREX injection may also prove effective, although the proportion of patients obtaining adequate relief was decreased and the latency to that relief is greater with lower doses. 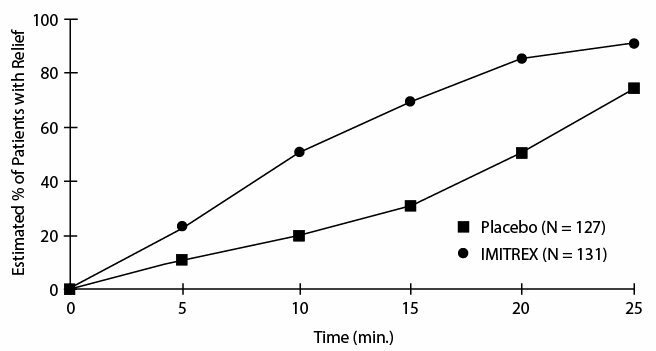 In Study 1, 6 different doses of IMITREX injection (n = 30 each group) were compared with placebo (n = 62) in a single-attack, parallel-group design; the dose-response relationship was found to be as shown in Table 2. In 2 randomized, placebo-controlled clinical trials of IMITREX injection 6 mg in 1,104 patients with moderate or severe migraine pain (Studies 2 and 3), the onset of relief was less than 10 minutes. Headache relief, as defined by a reduction in pain from severe or moderately severe to mild or no headache, was achieved in 70% of the patients within 1 hour of a single 6-mg subcutaneous dose of IMITREX injection. Approximately 82% and 65% of patients treated with IMITREX 6 mg had headache relief and were pain free within 2 hours, respectively. Table 3 shows the 1- and 2-hour efficacy results for IMITREX injection 6 mg in Studies 2 and 3.
b A successful outcome in terms of clinical disability was defined prospectively as ability to work mildly impaired or ability to work and function normally. c Includes patients that may have received an additional placebo injection 1 hour after the initial injection. d Includes patients that may have received an additional 6 mg of IMITREX injection 1 hour after the initial injection. IMITREX injection also relieved photophobia, phonophobia (sound sensitivity), nausea, and vomiting associated with migraine attacks. Similar efficacy was seen when patients self-administered IMITREX injection using the IMITREX STATdose Pen. The efficacy of IMITREX injection was unaffected by whether or not the migraine was associated with aura, duration of attack, gender or age of the patient, or concomitant use of common migraine prophylactic drugs (e.g., beta-blockers). The efficacy of IMITREX injection in the acute treatment of cluster headache was demonstrated in 2 randomized, double-blind, placebo-controlled, 2-period crossover trials (Studies 4 and 5). Patients aged 21 to 65 years were enrolled and were instructed to treat a moderate to very severe headache within 10 minutes of onset. Headache relief was defined as a reduction in headache severity to mild or no pain. In both trials, the proportion of individuals gaining relief at 10 or 15 minutes was significantly greater among patients receiving 6 mg of IMITREX injection compared with those who received placebo (see Table 4). n = Number of headaches treated. An estimate of the cumulative probability of a patient with a cluster headache obtaining relief after being treated with either IMITREX injection or placebo is presented in Figure 1. The plot was constructed with data from patients who either experienced relief or did not require (request) rescue medication within a period of 2 hours following treatment. As a consequence, the data in the plot are derived from only a subset of the 258 headaches treated (rescue medication was required in 52 of the 127 placebo-treated headaches and 18 of the 131 headaches treated with IMITREX injection). Other data suggest that treatment with IMITREX injection is not associated with an increase in early recurrence of headache and has little effect on the incidence of later-occurring headaches (i.e., those occurring after 2, but before 18 or 24 hours). Each pack contains a Patient Information and Instructions for Use leaflet. IMITREX STATdose System, 4 mg, containing 1 IMITREX STATdose Pen, 2 prefilled single-dose syringe cartridges, and 1 carrying case (NDC 0173-0739-00). IMITREX STATdose System, 6 mg, containing 1 IMITREX STATdose Pen, 2 prefilled single-dose syringe cartridges, and 1 carrying case (NDC 0173-0479-00). Two 4-mg single-dose prefilled syringe cartridges for use with IMITREX STATdose System (NDC 0173-0739-02). Two 6-mg single-dose prefilled syringe cartridges for use with IMITREX STATdose System (NDC 0173-0478-00). IMITREX injection single-dose vial (6 mg/0.5 mL) in cartons containing 5 vials (NDC 0173-0449-02). Store between 2° and 30°C (36° and 86°F). Protect from light. Inform patients that IMITREX injection may cause serious cardiovascular side effects such as myocardial infarction or stroke. Although serious cardiovascular events can occur without warning symptoms, patients should be alert for the signs and symptoms of chest pain, shortness of breath, irregular heartbeat, significant rise in blood pressure, weakness, and slurring of speech, and should ask for medical advice if any indicative sign or symptoms are observed. Apprise patients of the importance of this follow-up [see Warnings and Precautions (5.1, 5.2, 5.4, 5.5, 5.8)]. 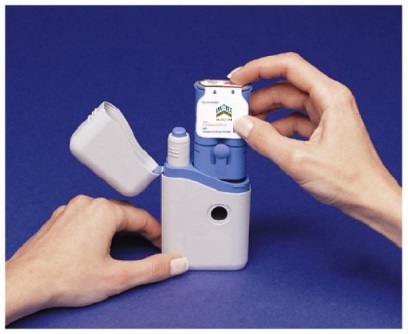 Inform patients that anaphylactic reactions have occurred in patients receiving IMITREX injection. Such reactions can be life-threatening or fatal. In general, anaphylactic reactions to drugs are more likely to occur in individuals with a history of sensitivity to multiple allergens [see Contraindications (4), Warnings and Precautions (5.9)]. Inform latex-sensitive patients that the needle shield of the IMITREX prefilled syringe contains dry natural rubber (a derivative of latex) that may cause allergic reactions in individuals sensitive to latex. Inform patients that use of IMITREX injection within 24 hours of another triptan or an ergot-type medication (including dihydroergotamine or methysergide) is contraindicated [see Contraindications (4), Drug Interactions (7.1, 7.3)]. 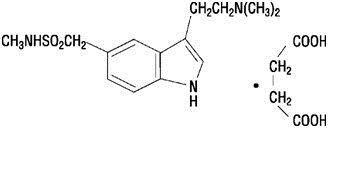 Caution patients about the risk of serotonin syndrome with the use of IMITREX injection or other triptans, particularly during combined use with SSRIs, SNRIs, TCAs, and MAO inhibitors [see Warnings and Precautions (5.7), Drug Interactions (7.4)]. Treatment with IMITREX injection may cause somnolence and dizziness; instruct patients to evaluate their ability to perform complex tasks after administration of IMITREX injection. Instruct patients to read the Instructions for Use before starting therapy. Provide patients instruction on the proper use of IMITREX injection if they are able to self-administer IMITREX injection in medically unsupervised situations. Instruct patients on storage and disposal of the pen [see How Supplied/Storage and Handling (16)]. Inform patients that the needle in the IMITREX STATdose Pen penetrates approximately 1/4 of an inch (5 to 6 mm). Inform patients that the injection is intended to be given subcutaneously and intramuscular or intravascular delivery should be avoided. Instruct patients to use injection sites with an adequate skin and subcutaneous thickness to accommodate the length of the needle. IMITREX injection is a prescription medicine used to treat acute migraine headaches with or without aura and acute cluster headaches in adults who have been diagnosed with migraine or cluster headaches. IMITREX is not used to prevent or decrease the number of migraine or cluster headaches you have. are breastfeeding or plan to breastfeed. IMITREX passes into your breast milk. It is not known if this can harm your baby. Talk with your healthcare provider about the best way to feed your baby if you take IMITREX. How should I take IMITREX? Certain people should take their first dose of IMITREX in their healthcare provider’s office or in another medical setting. Ask your healthcare provider if you should take your first dose in a medical setting. Do not take more than 12 mg in a 24‑hour period. You should write down when you have headaches and when you take IMITREX so you can talk with your healthcare provider about how IMITREX is working for you. What should I avoid while taking IMITREX? medication overuse headaches. Some people who use too many IMITREX injections may have worse headaches (medication overuse headache). If your headaches get worse, your healthcare provider may decide to stop your treatment with IMITREX. serotonin syndrome. Serotonin syndrome is a rare but serious problem that can happen in people using IMITREX, especially if IMITREX is used with anti‑depressant medicines called SSRIs or SNRIs. These are not all the possible side effects of IMITREX. Call your doctor for medical advice about side effects. You may report side effects to FDA at 1-800-FDA-1088. How should I store IMITREX injection? What are the ingredients in IMITREX injection? 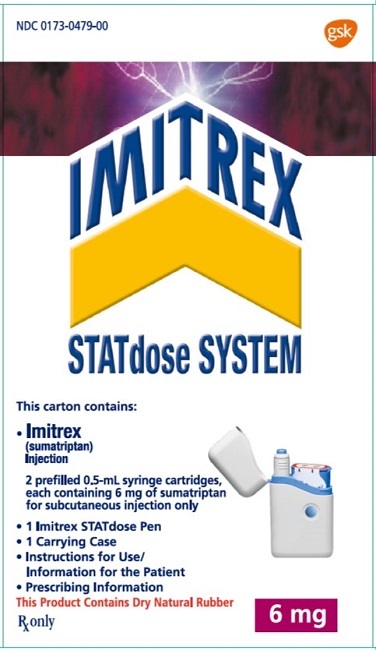 Read this Instructions for Use before you start to use the IMITREX STATdose System. There may be new information. This information does not take the place of talking with your healthcare provider about your medical condition or treatment. You and your healthcare provider should talk about IMITREX Injection when you start taking it and at regular checkups. Keep the IMITREX STATdose System out of the reach of children. When you first open the IMITREX STATdose System box, the Cartridge Pack and the IMITREX STATdose Pen are already in the Carrying Case for your convenience. The grey and blue Carrying Case is used for storing the unloaded Pen and the Cartridge Pack when they are not being used. The Cartridge Pack holds 2 individually sealed Syringe Cartridges. 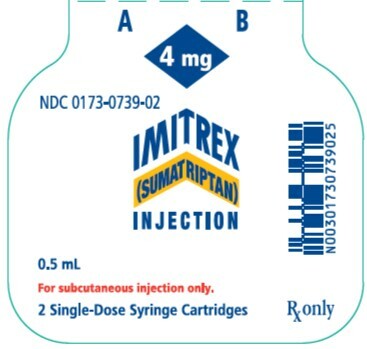 Each Syringe Cartridge holds 1 dose of IMITREX (sumatriptan succinate) Injection. The Cartridge Pack for the 4-mg strength of this medicine is yellow. 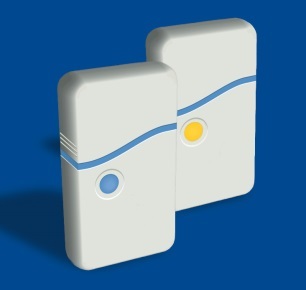 The Cartridge Pack for the 6-mg strength is blue (as shown). Refill Cartridge Packs are available. The needle shield of the prefilled syringe contains dry natural rubber, which is made from latex. This is a part you cannot usually see, but it could still cause an allergic reaction. Tell your healthcare provider if you are allergic to latex. Before you use IMITREX STATdose System your healthcare provider should show you or your caregiver how to give an injection the right way. 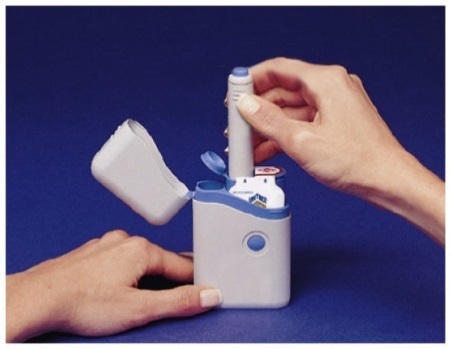 The Pen is used to automatically inject 1 dose of medicine from a Syringe Cartridge. 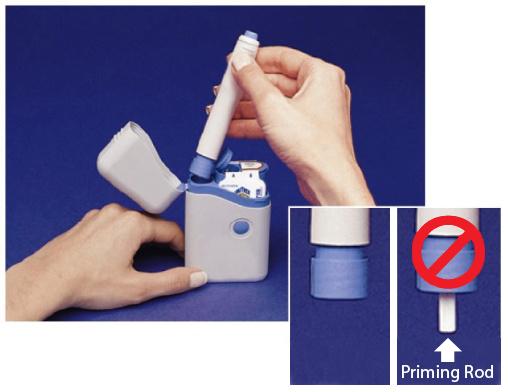 Before you load a Syringe Cartridge, always check to make sure that the white Priming Rod is not sticking out from the end of the Pen (as shown below in Figure B). If it is sticking out, you will lose that dose. Do not touch the Blue Button until you have pressed the Pen firmly against your skin to give a dose. The Pen will only work when the Safety Catch is released. To release the Safety Catch, you must press the Pen firmly against your skin until the grey part of the barrel slides against the blue part and it cannot be pressed any further. The grey part of the barrel must stay in contact with the blue part while you inject your medicine. When you inject the dose, make sure the Pen stays in contact with your skin during the injection. It is important to hold the Pen against the skin for at least 5 seconds. After each use the Pen must be put back into the Carrying Case to reset the white Priming Rod before the next use. Do not load the Pen until you are ready to give yourself an injection. while you are loading the Pen. Open the lid of the Carrying Case. Your new Carrying Case will come with 2 Syringe Cartridges already inside. The tamper-evident seals over the 2 Syringe Cartridges are labeled “A” and “B” (see Figure A). Always use the Syringe Cartridge marked “A” before the one marked “B” to help you keep track of your doses. Do not use if either seal is broken or missing when you first open the Carrying Case. Check the expiration date on the Cartridge Pack. Do not use if expired. Tear off one of the tamper-evident seals (see Figure A). Throw away the seal. Open the lid over the Syringe Cartridge. Hold the Pen by the ridges at the top. Take the Pen out of the Carrying Case (see Figure B). Check to make sure the white Priming Rod is not sticking out from the lower end of the Pen (see Figure B) . If it is sticking out, put the Pen back into the Carrying Case and press down firmly until you feel it click. Take the Pen out of the Carrying Case. Put the Pen in the open Cartridge Pack. Turn it to the right (clockwise) until it will not turn any more (about half a turn) (see Figure C). Hold the loaded Pen by the ridges and pull it straight out (see Figure D). You may need to pull hard on the Pen, but this is normal. Do not press the Blue Button yet. The Pen is now ready to use. Do not put the loaded Pen back into the Carrying Case because that will damage the needle. Choose and Prepare the Injection Site. Before injecting your medicine, choose one area with a fatty tissue layer (see Figure E or Figure F). Ask your healthcare provider if you have a question about where to inject your medicine. To prepare the area of skin where IMITREX is to be injected, wipe the injection site with an alcohol swab. Do not touch this area again before giving the injection. Be sure to change the injection site with each dose. Inject with the IMITREX STATdose Pen. Without pushing the Blue Button, press the loaded Pen firmly against the skin so that the grey part of the barrel slides against the blue part until it cannot be pressed any further. Make sure the grey part of the barrel stays in contact with the blue part that holds the Syringe Cartridge. This releases the Safety Catch that keeps the Pen from giving your injection by mistake or until you are ready (see Figure F). With the Pen still pressed firmly against the skin, push the Blue Button (see Figure G). Hold the Pen still for at least 5 seconds against the skin. If the Pen is taken away from your skin too soon, you will not receive all the medicine or it may leak out of the Pen. Remove STATdose Pen from your skin. After 5 seconds, carefully take the Pen away from your skin. The needle will be showing (see Figure H). 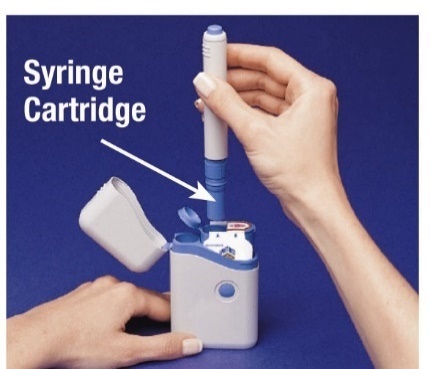 Right after you complete your injection with the Pen, you need to return the used Syringe Cartridge to the Cartridge Pack. Push the Pen down into the empty side of the Cartridge Pack as far as it will go (see Figure I). Turn the Pen to the left (counterclockwise) about half a turn until it is released from the Syringe Cartridge (see Figure J). Pull the empty Pen out of the Cartridge Pack. Because the Pen has now been used, the white Priming Rod will stick out from the lower end of the Pen (see Figure K). 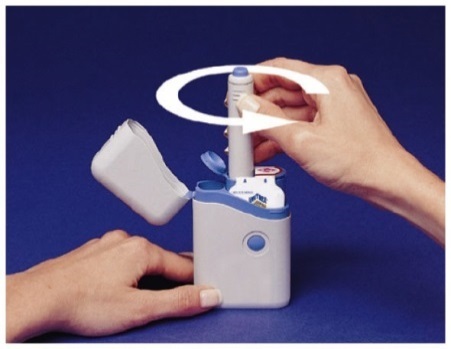 Close the Cartridge Pack lid over the used Syringe Cartridge. When the used Syringe Cartridges are inserted correctly, the Cartridge Pack is a disposable, protective case to help you avoid needle sticks. Put the Pen back into the Carrying Case and press it down firmly until you feel it click. This step is important to reset the Pen so that the white Priming Rod does not stick out and to get the Pen ready for the next use. Close the Carrying Case lid. If the lid will not close, push the Pen down until you feel it click. Then close the lid. 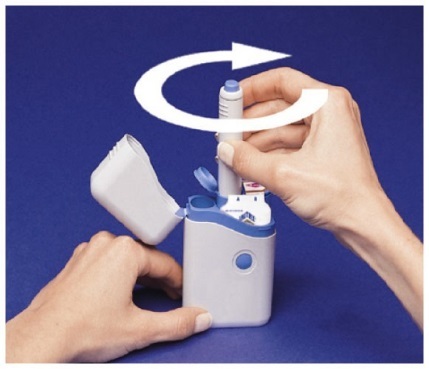 After both Syringe Cartridges have been used, take the Cartridge Pack out of the Carrying Case. Do not reuse or recycle a Syringe Cartridge. Open the Carrying Case lid. Hold the Carrying Case with one hand and press the 2 buttons on either side of the Carrying Case (see Figure L). Gently pull out the Cartridge Pack with the other hand (see Figure M). 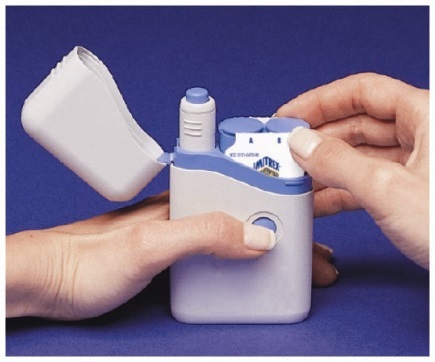 Throw away the Cartridge Pack or dispose of it as instructed by your healthcare provider. See “How to Dispose of your used Syringe Cartridge Pack” below. There may be special state and local laws for disposing of used needles and syringes. Take the new Cartridge Pack out of its box. Do not take off the tamper‑ evident seals (see Figure N). Put the Cartridge Pack in the Carrying Case. Slide it down smoothly (see Figure O). The Cartridge Pack will click into place when the 2 buttons show through the holes in the Carrying Case (see Figure P). Close the lid. 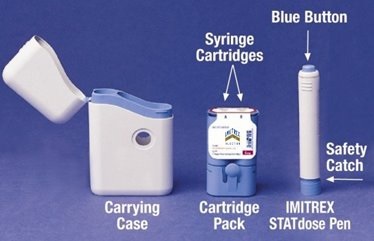 Put your used syringe cartridge pack in a FDA-cleared sharps disposal container right away after use (see Figure Q). Do not throw away (dispose of) loose needles and syringes in your household trash. 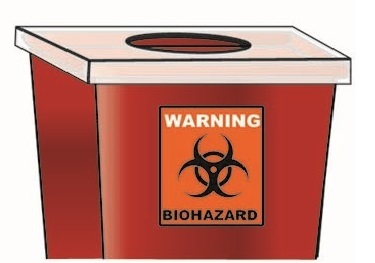 When your sharps disposal container is almost full, you will need to follow your community guidelines for the right way to dispose of your sharps disposal container. There may be state or local laws about how you should throw away used needles and cartridges. For more information about safe sharps disposal, and for specific information about sharps disposal in the state that you live in, go to the FDA’s website at: http://www.fda.gov/safesharpsdisposal. Single-dose vial. Discard unused portion. Do not use if tamper-evident label is broken or missing.